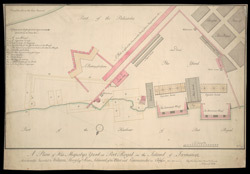 Plan of the ordnance yard in Port Royal, Jamaica, as it was in 1815. Port Royal had once been a thriving commercial port but was largely destroyed by an earthquake in 1692. The introduction of steam-powered vessels in the mid-19th century created a need for naval coaling stations and Port Royal was expanded to meet this demand.Once steam powered vessels were introduced in the mid 19th century the naval base there increased in importance and became a coaling station for naval ships The plan shows proposed improvements to the yard - a new wharf, offices, shops, boat houses and the construction of a new wall which would enlarge the yard's boundaries.